I have joined and like them. They send you a survey usually at least with .75 and so far have never been dq'd. You don't earn a buch but it is worth the time. Also I am older so younger people may get more surveys than me. I joined Go2Crowd, and I was satisfied with their format and not bothered by the low frequency of surveys but apparently there enough requests to increase the number of surveys and Go2Crowd tried to accommodate. Go2Crowd, is now using Cint! I bailed on Cint and all its permutations years ago. I don't like them, and they don't like me. They obviously have blacklisted me internally, I needle them every time I have to deal with their shenanigans, I am screened out of anything I participate in that they have their hand in. Example, the first Cint facilitated survey was a "get to know you" survey. Well I screened out. I have a well-established support email address book and I blasted every Cint contact plus every Go2Crowd address. Cint replied with a feeble and bogus response, that I was using a VPN on the smartphone. 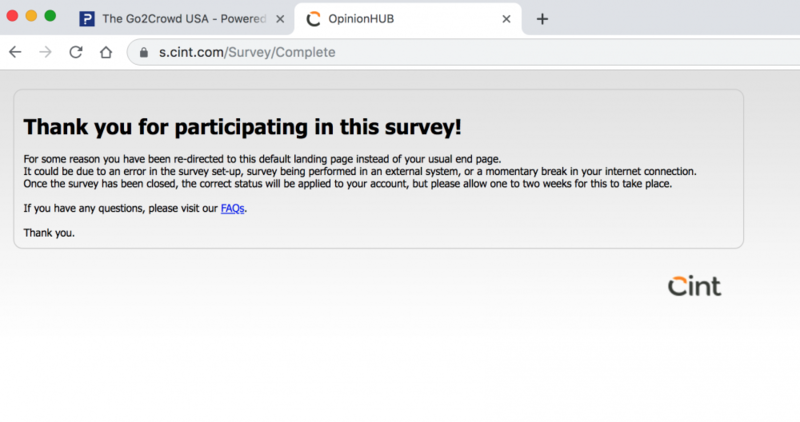 This brings up an interesting idea, just how many Privacy, TOS and other contractual obligations does a panelist have to contend with just to participate in a survey? Every panel that the router runs you through? I took a VERY long survey for them and never got the points. The Cint integration just keeps getting worse and worse. I just finished a long Cint/QPS/KTRMR survey and will get nothing. I've been getting these messages for years and replying to Cint from the link in the window always contains the same response, we can't figure out what survey you took and wee don't care. I received that page a few times when taking surveys on LifePoints.